Scooper - Technology News: Which is the world's fastest-growing major religion? Islam is growing faster than any other religion, according to a study by the Pew Research Center. In fact, most of the world's major religious groups are expected to rise in absolute numbers by 2050, the research finds, with Islam set to overtake Christianity and become the world’s dominant religion by 2070. 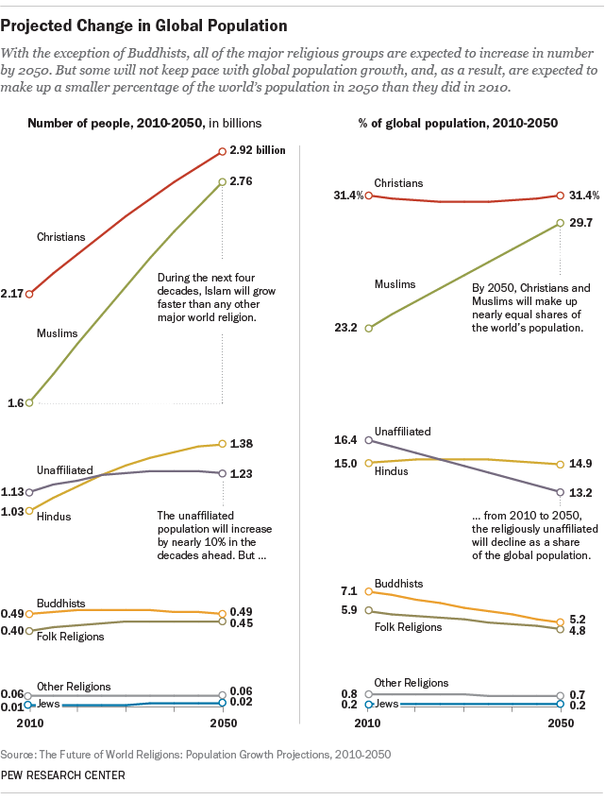 Those not affiliated with any religion, such as atheists and agnostics, will make up a declining share of the world’s total population by 2050, though their numbers are increasing in more secular nations such as France and the United States. The increase in followers of major religions will be, in large part, due to fertility rates and the size of youth populations in less secular nations. In 2050, Christianity will still be the world’s largest religious group, with around a third of the world’s population adhering to its various denominations. Islam is catching up quickly, though: Muslims make up the only major religious group projected to increase faster than the world’s population as a whole. One of the main factors driving the future growth of religions is where each group is geographically concentrated today. Religions with many followers in developing countries – where birth rates are high, and infant mortality rates have in general been falling – are likely to grow quickly. 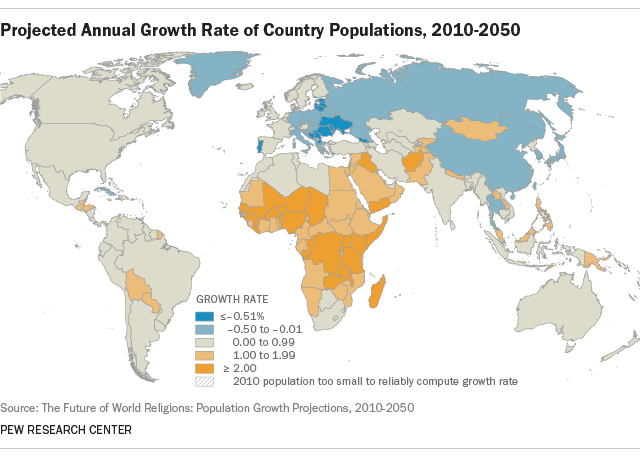 As such, much of the worldwide growth of Islam and Christianity will take place in regions such as sub-Saharan Africa, where the population is expected to rise by 12% by 2050. In contrast, the world’s religiously unaffiliated population is heavily concentrated in places with low fertility and ageing populations, such as North America, Europe, China and Japan. The low birth rate in China and Japan will also see falling numbers of Buddhists, as a proportion of the world population, by 2050, although the absolute number will remain stable, at around 486 million. 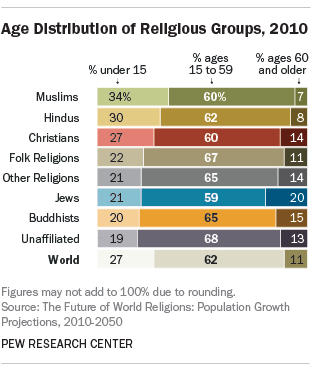 Another important factor for the growth of religion is the current age distribution of each faith group. In 2010, 34% of the world’s Muslim population was under 15 years old, while 30% of Hindus and 27% of Christians were also under 15. The large youth demographic is among the reasons why the number of Muslims is projected to grow faster than the world’s overall population. 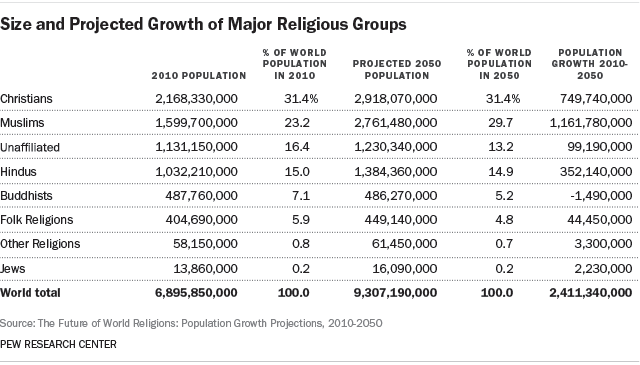 Hindus and Christians are expected to roughly keep pace with worldwide population growth, which is at 27%. All the remaining groups have smaller-than-average youth populations, and many of them have disproportionately high numbers of followers over the age of 59. In 2010, 11% of the world’s population was at least 60, but 20% of followers of the Jewish faith were 60 or older. The final factor that affects the growth of the world’s religions is when people convert to other faiths or become unaffiliated. It must be noted that conversion patterns are complex and varied, so Pew has provided full details of its methodology and research, excluding conversion data . 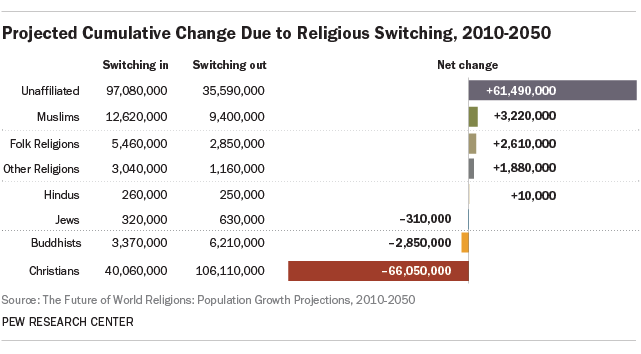 Over the next 30 years Christianity is expected to experience the largest net losses from religious switching, with 106 million predicted to leave the faith and only about 40 million people entering it as converts. Pew has pointed out, however, that the research was conducted with current population data and assumptions made about demographic trends. This means many factors could alter the trajectories predicted in the report. For example, if a large share of China’s population were to switch to Christianity , that shift could bolster Christianity’s current position as the world’s most populous religion. Alternatively, if disaffiliation were to become common in countries with large Muslim populations, as it is now in some countries with large Christian populations such as the United Kingdom, the rise in the number of Muslims worldwide would be less dramatic. Have you read? How religious will the world be in 2050? How strongly do different nationalities feel about religion? Can faith make economic growth fairer?